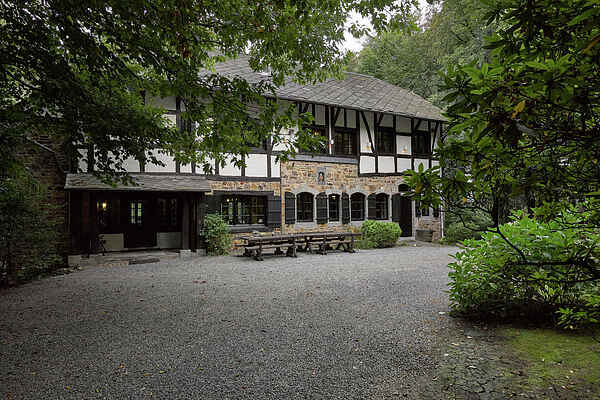 This beautiful Ardennes castle villa is located in a wooded area in the middle of the Belgian Ardennes and offers great views of the city Spa. The villa dates back to 1938 and features the typical Ardennes farmhouse style. The villa has been renovated, retaining the original features. For example there still are oak floors and original Namur stones. Relaxation can be found in the Finnish sauna and Jacuzzi. In summer you can enjoy relaxing in the sun on the large patio. The garden is completely enclosed and no less than 4,000 m2 in size. Children will enjoy the playground equipment, while you enjoy the view and a nice barbecue. Spa is of course world famous for its mineral water, discovered in the fourteenth century. It literally rises up from the ground in the city! Visit one of the seven springs or visit the Spa thermal baths. At a few kilometres you'll find is the High Fens nature reserve, where you can make the most beautiful walks and enjoy the peace and tranquility that reigns here. Also worthwhile are the Coo waterfalls, the caves of Remouchamps and the lake of Warfaaz.